Travelling with babies, even toddlers for that matter, is never easy. I've been on both the receiving side of travelling with my crying baby as well as being the passenger grimacing in anguish as a mother tries to calm her shrieking little one - compounded by the rubber-necking of those passengers who have just not learned this level of empathy as yet. It's awful. Flying with infants can be a daunting and draining experience but it doesn’t have to be that way. But take-off and getting settled in your seat for the flight is just one aspect of the journey. Here Turkish Airlines, recently rated as 5-star in the Apex Awards, shares a few tips for flying with infants and children. 1. For any long-haul flight, book early and check-in online early to make sure you book a seat with a bassinet (or crib) in front of you. 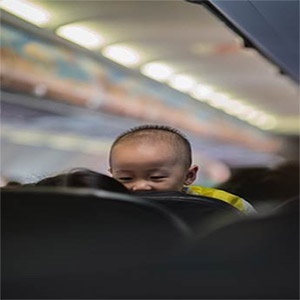 Remember that you will have to take the child out of the bassinet when the plane is taking off or landing, and when there is turbulence, so ensure that you can pick your child up easily without disturbing them unduly. For short-haul flights, some mothers prefer a window seat for privacy if they are breast feeding. 2. Use your pram to keep all your hand baggage items together while you’re in transit or working through the airport checks. Turkish Airlines will collect the pram when you board, keep it in a protective sheath and deliver it back to you upon disembarking. 3. Have a good, segmented baby bag sorted out and accessible. It can be stressful to be searching around in a dark, confined space for an urgently needed item. Dummies, bottles, special sleeping blankets and food all need to be in easily findable spaces. Non-essentials can be in the overhead locker. Click here for a handy, printable packing checklist - it makes packing easier and minimises the chance of forgetting something. 4. If the fasten seatbelt light is off, take your baby for a walk around the plane even if they’re calm. The change of scenery and the movement will help them to stay settled. 5. Changes in cabin pressure do affect some babies. It can help to feed them during take-offs and landings to help reduce pressure. 6. Parents can feel unduly stressed that a crying baby is disturbing the rest of the cabin. Remember that the noise is loudest for you and fellow passengers are usually completely understanding. Most importantly, it will help your baby settle quicker if you can remain calm rather than feeling anxious about everyone else. 7. Only use medications that you have had properly prescribed and preferably have used before. Sometimes a sedative can have the opposite effect on a baby and cause them to be become agitated and to remain wide awake. 8. Change a nappy just before you board. There are usually good facilities aboard planes but it’s always easier to do this on the ground. If you’re travelling with a partner, you might want to get them to board early to set up the space and get organised, while you take the extra time in the terminal to give the baby different scenery and some more space. 9. Make sure your documents are all in order – for you and your baby - and easily accessible. 10. Airlines staff are fully trained to be of assistance to parents. Make use of them. They will have some back-up supplies and can offer advice and an extra pair of hands.